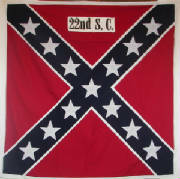 The Twenty-Second South Carolina Volunteer Infantry was organized on Jan. 28th, 1861 at Camp Hampton near Columbia, SC. The regiment fielded some 1,100 Officers and men when they were mustered into Confederate service in the Spring of 1861. The regiment was placed under the command of Gen. Nathan "Shanks" Evans Independent Brigade. The first duty for the 22nd SCVI was at Charleston, SC in the defense of the city. And the first engagement was at Secessionville on James Island, SC at Ft. Lamar. One company saw action at Lamar while the rest of the regiment was stationed to the north along Ft. Johnson Rd. After Secessionville the 22nd SC along with the 17th, 18th, 23rd and Holcombe's Legion was sent north to Virginia. The regiment saw action with the Army of Northern Virginia at Boonesboro and Sharpsburg, MD. The 22nd SC had heavy casualties at Sharpsburg (Antietam), MD. Evan's Brigade was sent to North Carolina for the Winter of 1862-3 and saw action at Kinston and Goldsbourgh, NC. After seeing action in North Carolina Evan's Brigade was sent back to South Carolina and then to Jackson, MS. While in Mississippi the 22nd SC saw limited action with Gen. Johnston's Army at Jackson, MS. After the fall of Vicksburg on July 4th, 1863 the brigade was again sent back to South Carolina. Along the way the 22nd SC was stationed at Savannah, GA. Evan's Brigade spent the rest of 1863 and the first part of 1864 manning the defenses of Sullivan's Island near Ft. Moultrie. The 26th SC was added to the brigade in early 1864. In the Spring of '64 the brigade was sent back to Virginia. Now under the command of Gen. W. S. Walker. The 22nd SC was placed in the trenches south of Richmond, VA and later in the Siege of Petersburg. Gen. Walker was wounded and captured at Hewlett's Farm, VA. Gen. Stephen Elliott was given command of the brigade in May 1864. The Roll Call for the 22nd SC on July 28th numbered 329 Officers and men. On July 30th, 1864 the 22nd SC along with the 18th SC and Pegram's Battery of four heavy guns was blown to bits by a mine dug under "Elliott's Salient". In the blast the 22nd SC instantly lost over 170 Officers and Enlisted Men. Elliott's Brigade lost over 325 Officers and Enlisted Men. Gen. Elliott himself was severely wounded while leading the counter-attack of his shattered brigade. Gen. Elliott died within a year after the war ended due to his wounds from the The Crater. It was one of the most tragic days for a South Carolina Regiment and a brigade during the war. Roll Call for the 22nd SC on August 1st numbered 86 Officers and Men. The 22nd SC also lost their Regimental commander Colonel David G. Fleming in the blast, his body was never recovered. Gen. William Wallace took over command of the brigade due to Elliott's sever wounds. For the rest of the Petersburg Siege the 22nd SC was engaged in the assault on Ft. Steedman and engaged at Gravely Run. On April 1st the 22nd SC along with the brigade was heavily engaged at Five Forks, Va. In the withdrawal from Petersburg, Va the 22nd SC saw action at Saylor's Creek. Wallace's Brigade was one of the first on the scene at Appomattox Courthouse, VA and engaged Gen. Custer's Cavalry on the morning of the 9th of April 1865. After Gen. Lee surrendered the Army of Northern Virginia the 22nd South Carolina Volunteer Infantry marched through Appomattox Courthouse on the 12th of April and gave up their arms. Four years took their toll on the 22nd SC and only 77 paroles were signed at Appomattox. And Five Companies of the 22nd SC had fewer than 10 in their ranks. After that they went home.